RECAP: Hanley Ramirez and Mookie Betts Both Go Yard as #RedSox Win Fourth Straight. Making a quick stop in South Beach, the Red Sox looked to take advantage of their matchup against a Marlins team not expected to do much this season. In the first of their two game set, Brian Johnson was matched up against Trevor Richards, who was making his Major League debut for Miami. Like Hector Velazquez, Johnson is most likely an injury fill-in in the Red Sox rotation. The former Florida Gator got the job done on Monday, as he allowed one earned run over six full innings pitched, striking out five along the way. There were times where it looked like the Marlins were about to get to Johnson, since they did reach base eight times on him, but the southpaw avoided any major damage. The only run he gave up came on a solo shot off the bat of third baseman Brian Anderson in the second inning, which put the Marlins up 1-0 at the time. When he departed after retiring the side in the sixth, Johnson had thrown 82 pitches, 49 of which went for strikes. The Red Sox only needed two relief pitchers to wrap up the win last night. Heath Hembree tossed a scoreless seventh inning, and Marcus Walden allowed two runs to score while pitching the last two innings. Not a great look for Walden, honestly. He has got hit pretty hard in the two games he has pitched in, but he was able to finish the game. The Red Sox did not have to go to Craig Kimbrel in this one, that’s always a good thing when you can save him for more appearances later in the season. Offensively, the Red Sox lineup had its best day of the season so far. They scored a season high seven runs on 12 hits and three walks. After Trevor Richards held them scoreless through the first three innings, the bats woke up in the fourth. With two outs in the inning, Xander Bogaerts got the rally started with an infield single down the third base line. Eduardo Nunez then drove Bogaerts in from first on an RBI double. A Jackie Bradley Jr. walk set up Christian Vazquez for an ideal RBI opportunity with runners on first and second. On the first pitch he saw, the catcher ripped a line drive down the third base line, scoring both Nunez and Bradley for his first RBIs of the season. In the very next inning, the Red Sox tacked on two more runs to up their total to five. With one out and Andrew Benintendi at first thanks to his first hit of the season, Hanley Ramirez did some damage. The former Marlin must enjoy playing in Miami, because he looked really comfortable at the plate and at first base last night. On a 1-1 slider, Ramirez took Richards deep to left field for his first long ball of the season, putting his team up by four runs. Ramirez guaranteed a 30 HR, 30 SB season earlier in Spring Training, and he’s only 29 home runs and 28 stolen bases away from that now with the performance he put on last night. Hanley wouldn’t be the only one to hit his first home run of the year. Fast forward to the top of the seventh, and Mookie Betts went yard to left field as well. He golfed it to put the Red Sox up by five at the time. The last run the Red Sox scored came two innings later. Wanting to add to his team high of four RBI’s, Rafael Devers ripped a double to center for his second hit of the game, scoring Hanley Ramirez from from second after he stole his second base of the season, and all but guaranteeing the win for his club. That makes four straight wins for the Red Sox, and by all means they should be 5-0. That’s in the past though, so I’ll take 4-1. Through their first go around in the rotation, Red Sox starters own a line of 30 IP, 22 H, 3 ER, 7 BB, and 28 K’s. With two-fifths of their regular starters missing, those are some impressive numbers. Chris Sale gets the start an hour earlier than usual tonight. He’ll be squaring off against Marlins “ace” Jose Urena. First pitch is at 6:10 PM. 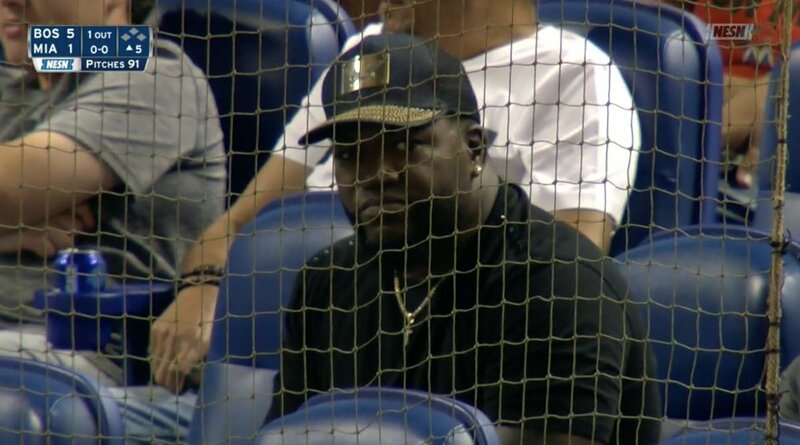 Also, almost forgot to mention the fact that the greatest Designated Hitter of all time was in attendance for last night’s win. Previous Previous post: RECAP: #RedSox Win First Series of Season Thanks in Part to Hector Velazquez. Next Next post: VERY LATE RECAP: Hanley Ramirez’s Go-Ahead 2 RBI Double Gives #RedSox the 4-2 Win in Extras.